I bought a copy of this book at my library’s semi annual book sale. This was a pretty interesting book, that was a pretty quick read. When a new store called Needful Things opens in the small town of Castle Rock, the people that live there are very curious. One by one, they realize that the owner, Mr. Gaunt, has the one object they want more than anything else in the world, and it can be theirs for an amazingly small price, as long they they agree to play a harmless prank on another person in town. Mr. Gaunt weaves his increasingly dangerous web around the town, and the outcome is explosive. The one voice of reason- and sanity- is Sheriff Pangborn, a wonderful character that one expects from King- a flawed but genuinely good person. Unfortunately these good characters are almost always men- Stu Redmen, Chris Chambers, Andy Dufresne, Mike Noonan, Paul Edgecombe. Why aren’t the woman ever the great character, Mr. King? 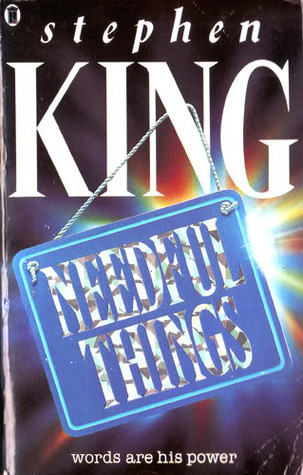 Needful Things, while not my favorite King novel- Hello The Stand- is a good read. It reminded me a little of Under The Dome, so if you enjoyed that, you will like this too.